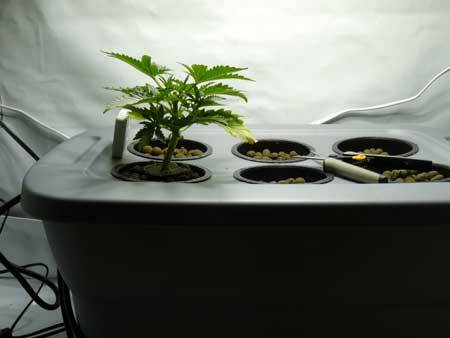 Low Stress Training or LST is like bonsai for cannabis plants. It’s the practice of gently bending stems and tying them in place to drastically change the shape of the plant. 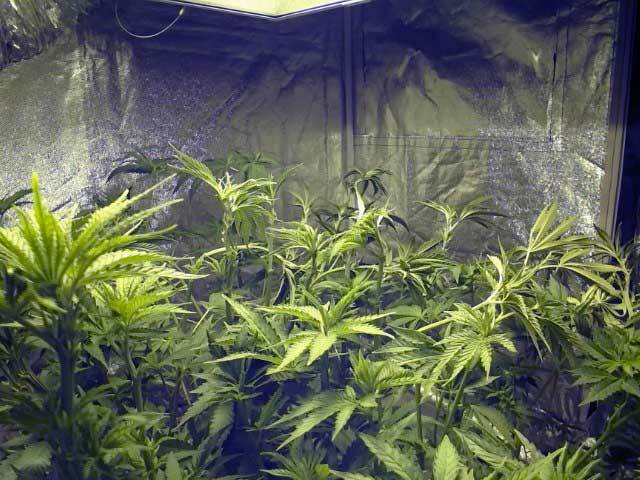 This is done to create multiple bud sites, even out the canopy, and overall help you use light more efficiently. Using LST can increase marijuana yields without changing your setup, and it's also surprisingly fun! 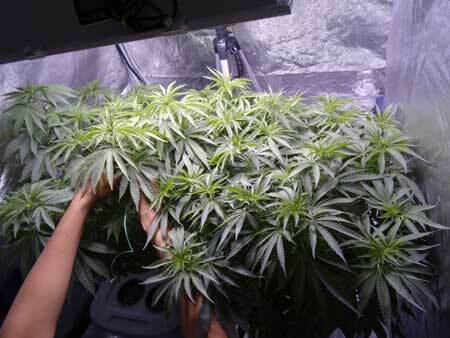 Example: All this bud is growing on a single 18" tall weed plant in someone's homemade grow box. LST forced the plant to stay short and grow multiple colas. Low stress training can be used to grow marijuana plants in any size or shape. 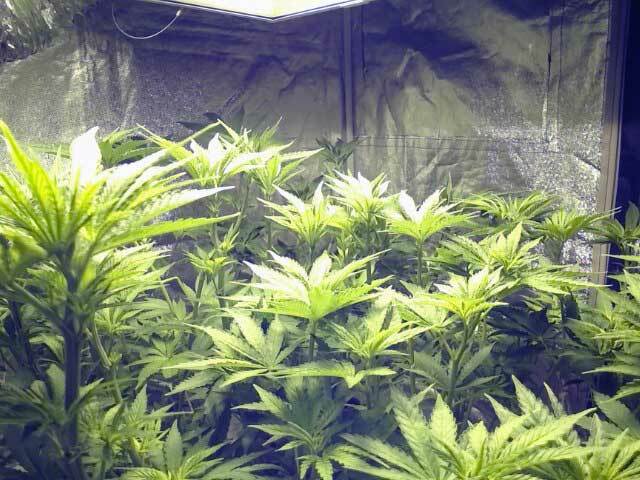 This grower trained his outdoor cannabis plants to grow flat like hedges by training stems to grow along a ScrOG net. What is "Low Stress Training" and how does it increase yields for cannabis growers? Low stress training is used to form a relatively flat, even canopy. This exposes many bud sites to direct light instead of just the top main bud. 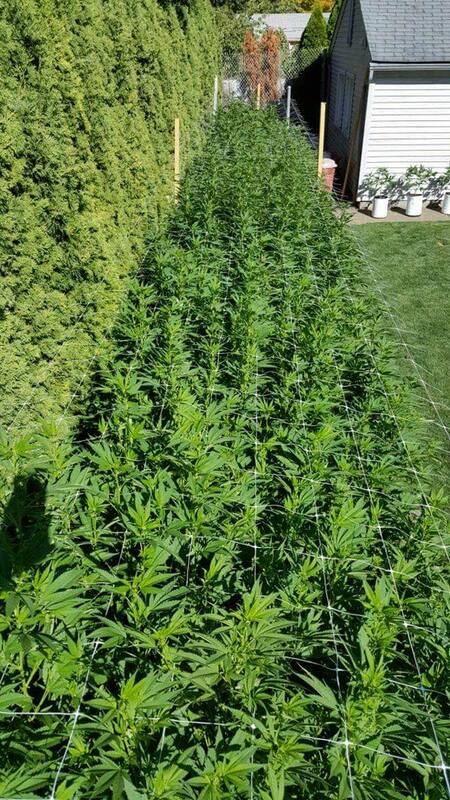 As a result, trained marijuana plants naturally create more (and bigger) buds in the same environment or setup than untrained plants. There are other free cannabis plant training techniques that are more "high stress" such as manifolding the plant, but LST will not stress your plant or slow down growth much, if at all. Two Papaya plants were LST'ed to produce many fat, thick colas! The idea behind LST is to bend and otherwise gently manipulate cannabis so your plants create multiple main "colas" or buds. Additionally, Low Stress Training lets you produce plants that grow in the exact shape and size you want, giving indoor growers much bigger yields from the same grow lights. 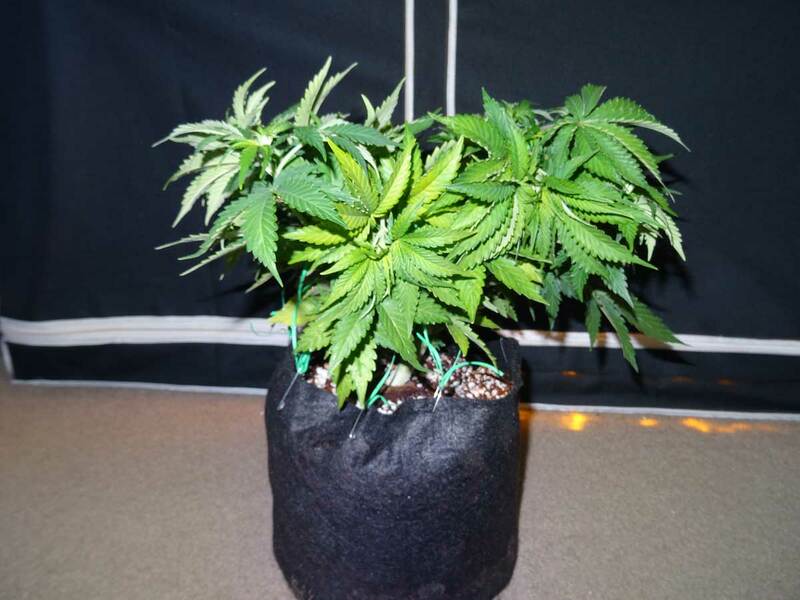 The LST technique can be used to reduce the height of marijuana plants that are getting too tall for your setup, or are growing taller than your other cannabis plants. 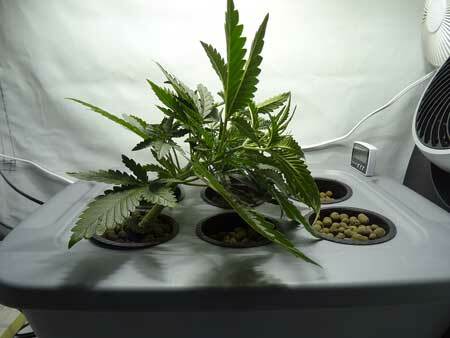 LST allows you to keep an even canopy and get as much bud as possible from your light. 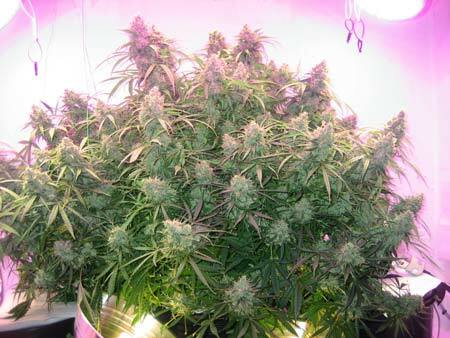 This marijuana plant is only a foot tall yet is engulfed in fat buds. 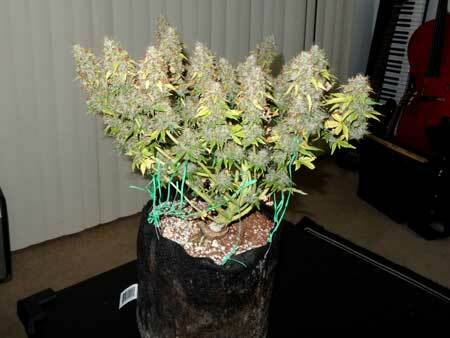 Now take a look at the "guts" of this plant to see how this shape was achieved with LST. It was trained to grow in a spiral! The main stem was first bent down and away from the center of the plant, towards the side. 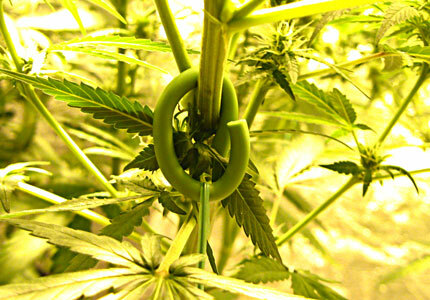 After that, the grower continued to bend the main stem in a circle around the plant. As a result, several lower growth tips rose up to become colas with fat chunky buds, giving much bigger yields than if there was just one main cola. LST allows a better distribution of light since all parts of the plant (and therefore all the potential bud sites) are located the proper distance from your grow lights. When it comes to indoor growing, bud sites at the proper distance from your grow light (in the "Sweet Spot") produce the biggest buds. Wait, what distance should my grow light be from my plants? What's the sweet spot for my particular grow light? 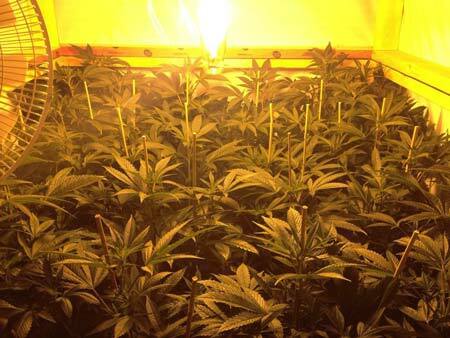 Learn even more about cannabis grow lights here. The percentages on the sides of the following diagram describe how much light is getting to your plants according to the Inverse Square Law of Light Intensity. As you can see, the light intensity drops off fast as you get further away from the lights! You need training to get more buds in that sweet spot. Why settle with just one big cola when you could have many huge colas? How Does Low Stress Training Work? Low stress training involves bending unruly branches and using gardening wire or soft ties to hold the branches where you want them. 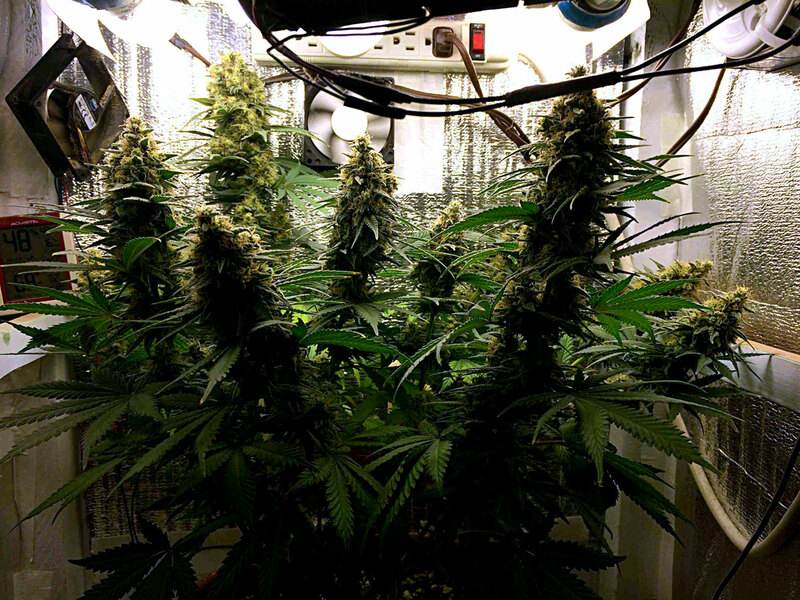 The majority of growers use LST are trying to keep their plants short and wide to take advantage of grow lights (or possible the sun), which means that you want to bend any branches down and secure them away from the other branches, so you're creating a wider canopy with many colas for bud to grow out of. Bend too-tall branches down and away from the center of your plant. Tie them down. Repeat until plant is flat! Bend the tallest ones over until they're all the same height as each other and secure them down with something like twisty tie or plant ties. Repeat if necessary. After harvesting all the buds, you can see the "skeleton" of the plant. Some growers like to install a tomato ring so there's something to attach the plant to besides the pot itself. These can also offer additional support if the plant gets very large down the road. This grower stuck a few bamboo stakes in every pot, which can also be used for support. When growers LST their plants, the general idea is to gently pull branches away from the middle of the plant, so that the plant looks like a star when viewed from above. This helps expose the lower branches to more light, while also keeping plants short. 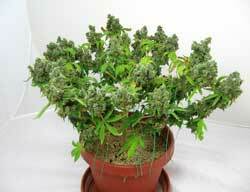 Many growers cut or pinch off the tops their plants before starting LST work. This is not necessary but can be helpful. 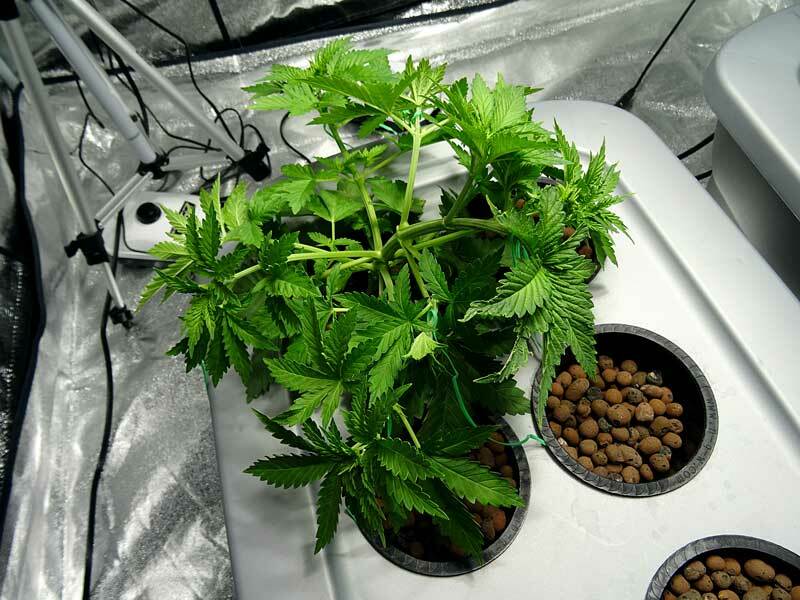 The reason for pinching off the tops is it breaks the apical dominance of the cannabis plant, splitting the main cola, and providing a more symmetrical base of the plant for training. However, any cutting technique is not actually considered LST. LST is simply the act of actually bending and manipulating stems. 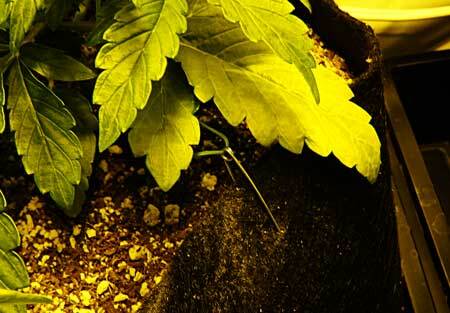 Other plant training techniques are often used alongside LST to get the best results, and topping the plant when it's young is one of the most popular ways to "set the stage" for LST. 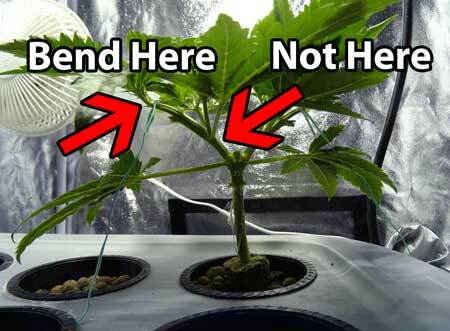 But topping your plant isn't for every grower. In this article's step-by-step LST tutorial below, I'll walk you through the entire process of how to LST cannabis plants including any special plant training techniques. Auto-Flowering Strains: Those who are growing auto-flowering strains are often encouraged to skip the cutting part and go straight to LST. Auto-flowering plants go through their entire life in just 2-3 months and may not have a long enough vegetative period for the plant to recover from a cutting/topping technique if it goes wrong. However, auto-flowering strains can be topped if you do it right! 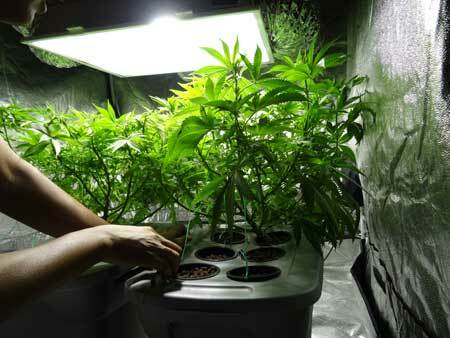 Learn how to train auto-flowering plants properly here. Eventually all the growth tips on a horizontal branch will start growing upward toward the light and become full-blown colas. 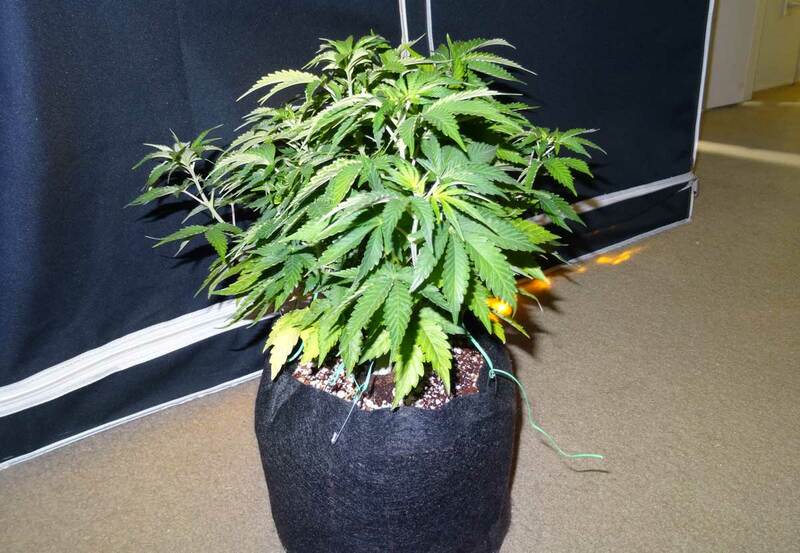 After initially bending your plant, it's possible growth may slow down for day or two as the plant recovers, especially if stems are damaged in the process. But usually with LST there's little to no recovery time and the plant gets right back to business as usual. Often times they'll be pointing back up at the light in just a few hours. If you plan on using LST, I highly recommend getting a spool of plant ties, twisty tie or coated wire to tie your plants down with. There are many options available at your local gardening store or online, or you can rig something together yourself. More on that below. This gives you the power to craft the shape of your plant like an artist. Don't use string or anything sharp to tie down plants for LST! Anything sharp can cut into your plants as they grow bigger, which you don't want. Open wounds are not good for cannabis growth. 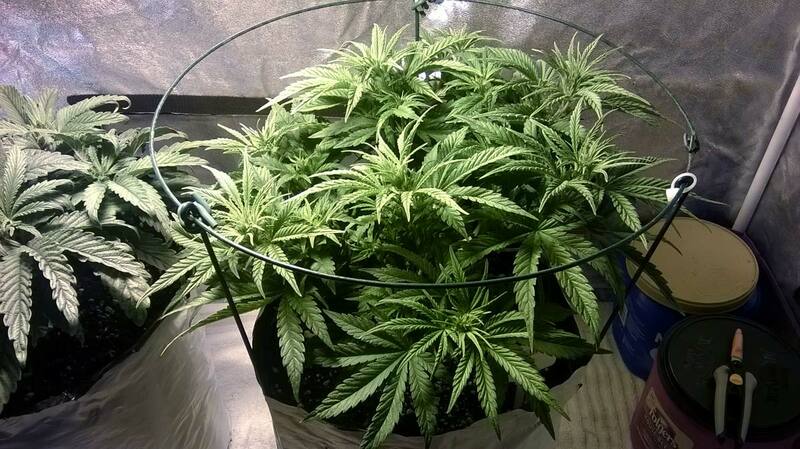 But soft wire ties, twisty ties, or anything soft and bendable will work perfectly without hurting your plants. 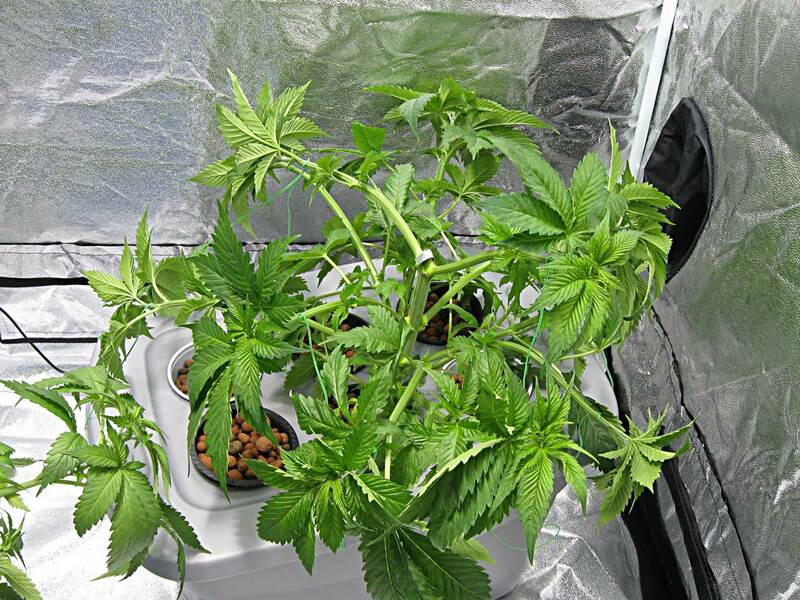 The stems you bend over with LST can be tied to the pots your plants are in, your hydroponics bucket, a tomato cage or most anything you can think of. My main piece of advice is to make sure that you can pick up your plant as one unit. Don't anchor any part of your plant to the floor or it will be difficult to move your plant! 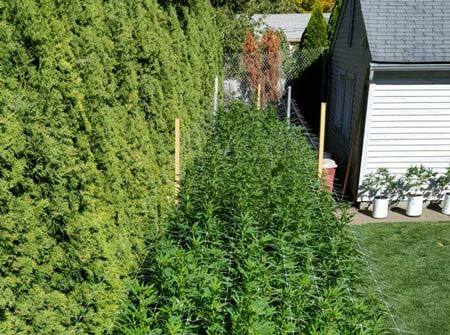 Learn how one grower uses Low Stress Training to create a "Screen of Green" in his cannabis garden. 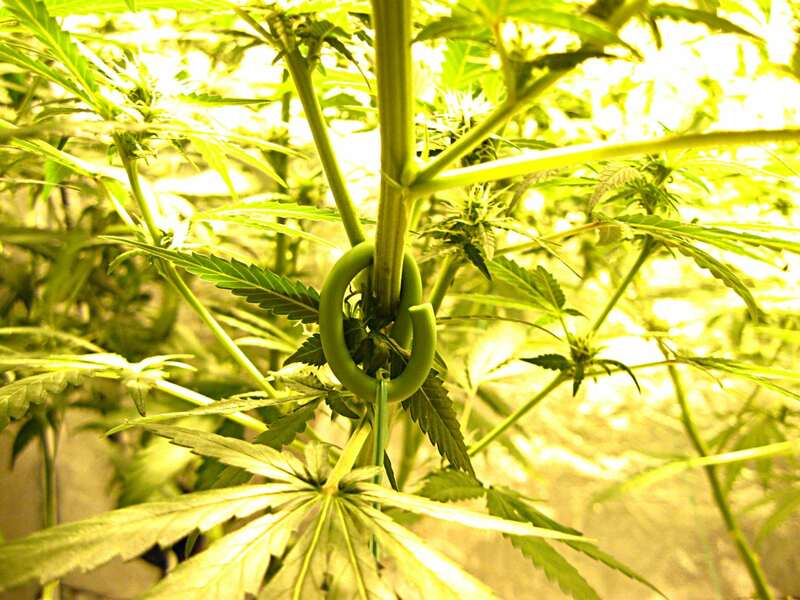 Some growers also gently bend flexible branches until they snap slightly or crush the bent part between their fingers to cause slight damage to the bent point. This technique is known as super cropping. 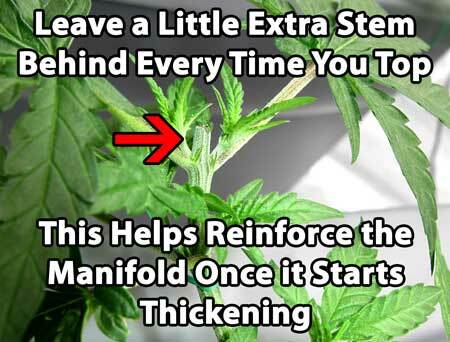 Whenever you notice some stems are getting taller than others, bend them over and secure them down. This ensures a nice even canopy! 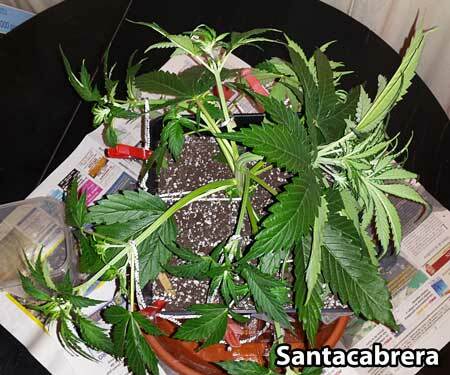 Basically, you're training the plant to grow into the shape you desire, like a marijuana bonsai tree. You train the plant slowly and take care not to hurt you plant. You don't want to snap any of the branches, and never try to bend stiff branches or they'll just break off. If you accidently hurt the plant, and you create an open wound, it's important to tape up the wound to keep it closed while also providing support to the stem. The tape acts like a bandage and cast until your plant has healed. If you accidentally snap a stem while bending, tape it up immediately! Most of the time your plant will recover just fine. 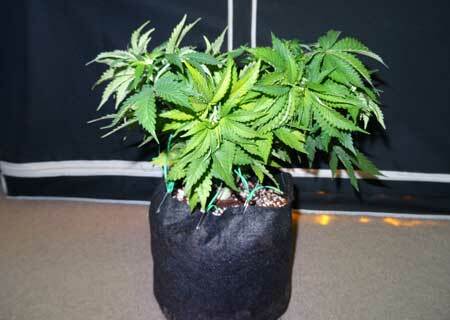 By using the LST method alone, you can grow a plant that conforms to nearly any shape that you want. What else can be used to secure plants? I've seen growers use pipe cleaners, coated wire, and more. You can use almost anything that isn't sharp or thin like string (string can cut into the "skin" of the plant after a while). Step 1: Top your young plant when it's got 4-6 nodes. Note: Growing with autos? Learn how to Top an Auto-Flowering Strain! 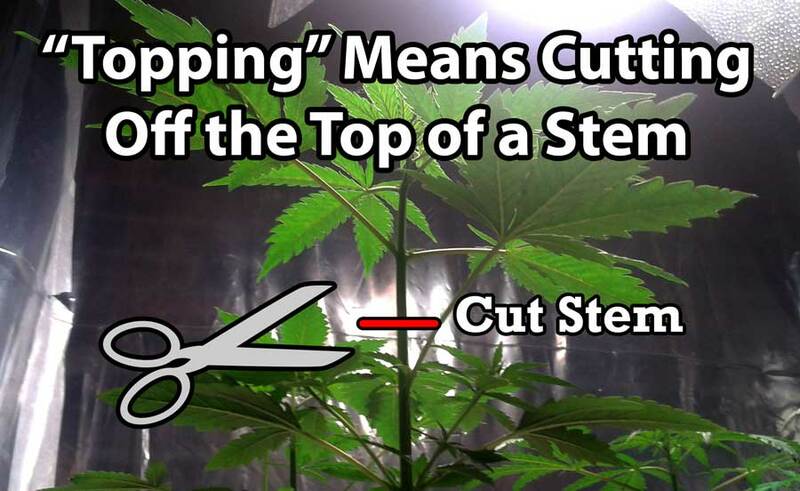 The purpose of any cannabis cutting technique is to break the apical dominance of a cannabis plant. 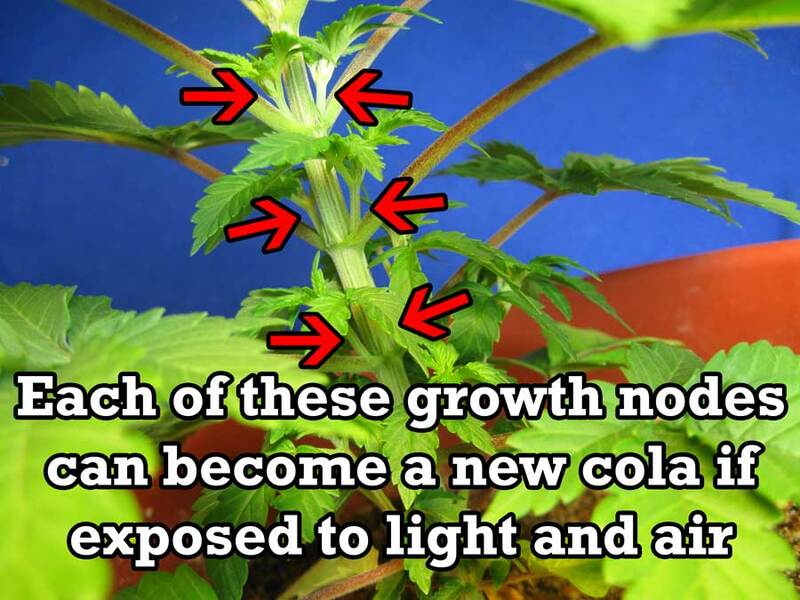 When you cut the "trunk" or main stem of a cannabis plant, the plant tends to start branching out and allowing lower growth tips to rise up and become colas. Topping makes it easier to LST a cannabis plant, since you're given a more symmetrical "platform" to build your base off of instead of working just with one main stem. 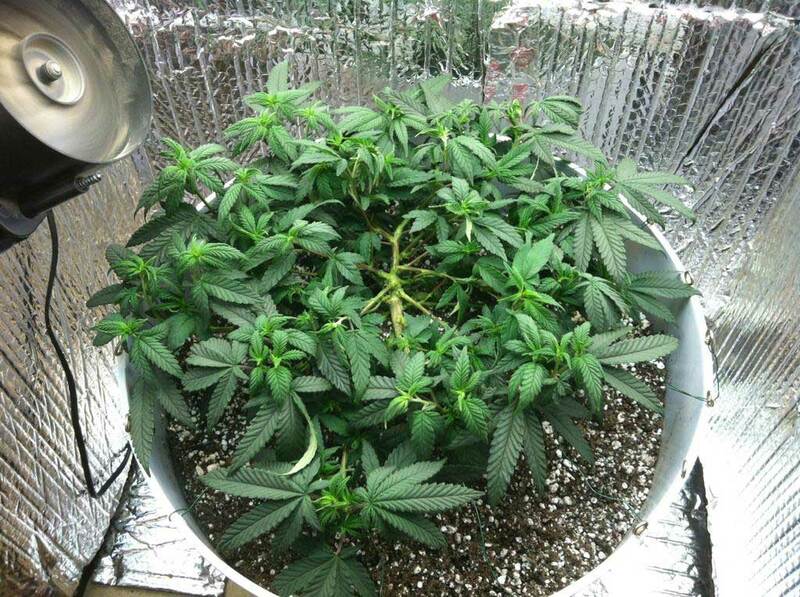 Using the topping training technique will encourage your plants to start growing more wide and bushy. I prefer to top my plants when they've grown 4-6 nodes, although some growers top earlier. I typically top plants down to the 3rd node, which forms a more symmetric base compared to topping higher up on the plant. With topping you always end up with two main colas that split at the same place on the stem. Don't let your cannabis plant get bigger than this before topping if you can help it! If you top your plant too early, it can stunt growth and your plant may take a while to recover. Your plant should be healthy and growing fast. 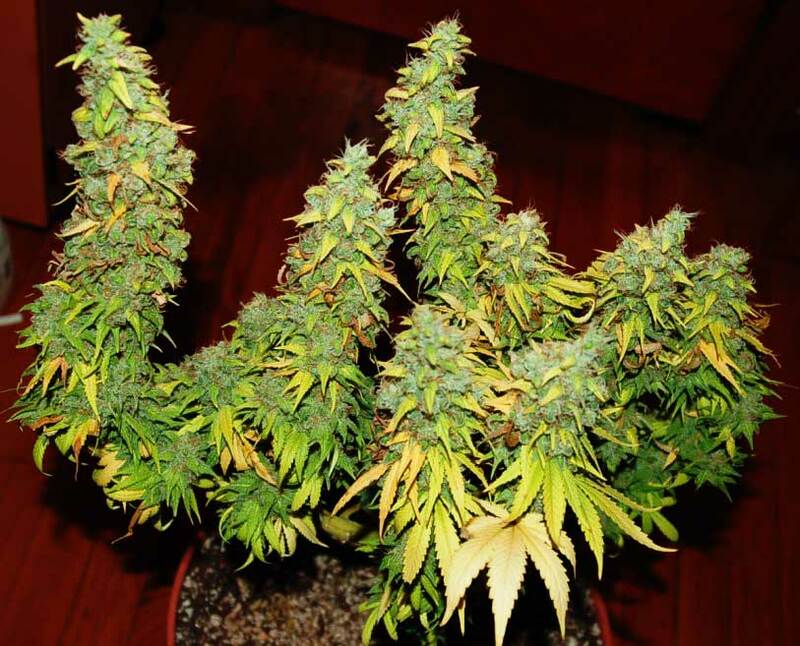 A vigorous plant will recover quickly from topping, but a very young or slow-growing plant can get stunted for days or weeks from a single topping. 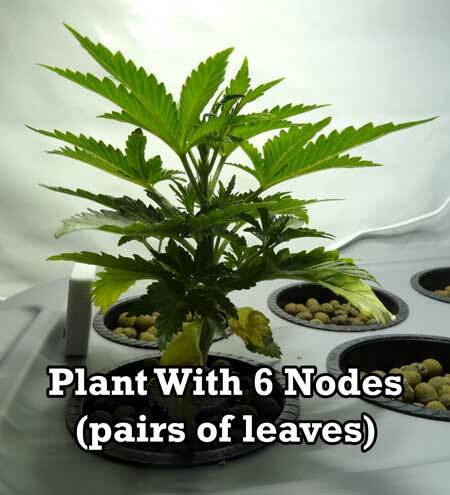 Although it may seem counterintuitive, letting the plant grow 6 nodes first can make the whole process go more smoothly because at that point there is very little chance of stunting your plant. 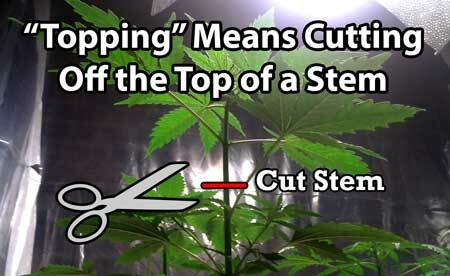 As we explained earlier, "topping" means to cut off the top of a plant or stem. 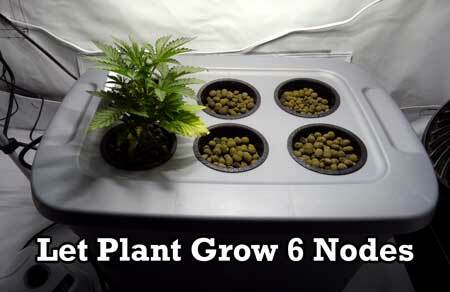 In the picture below, the top of the plant has been removed, so that only 3 nodes (pairs of fan leaves) are left. 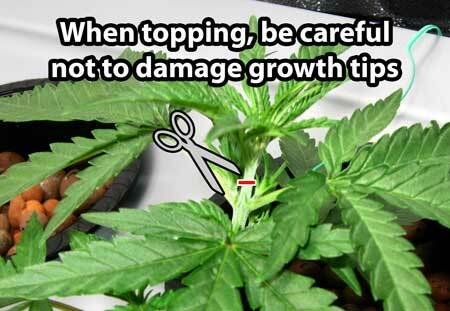 When topping, leave a little part of the old stem above the topping point. I know this may be hard for those who want to make everything completely even and neat. But leaving a little extra stem will help prevent your “elbows” from splitting until they have thickened. 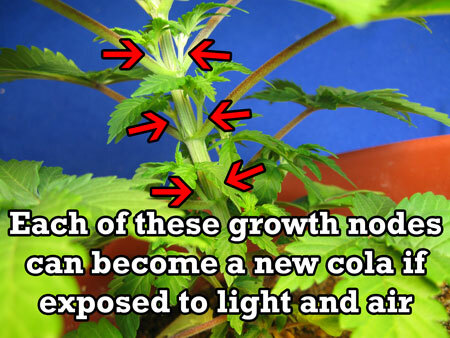 The little growth tips nestled in the V of each fan leaf will become your new colas, so be careful not to injure them! After this, it's time to let your plant grow naturally for a while, until it's grown several new nodes on each of the two main growth tips. Step 2: Bend over tallest stems and tie them down. The main idea is to keep all the stems about the same distance from the light. So, you want to continually bend the tallest stems down to the level of the others, and use twisty tie to secure it in place. Another basic technique is to create a "star shape" from above. 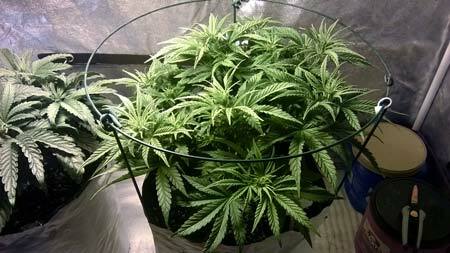 As your plant grows, you bend stems down and away from the middle of the plant, tie them down. Some strains/branches will bend more easily than others. Young growth is almost always easier to bend than old growth. Bend Stems When They Are Still Young and Flexible! 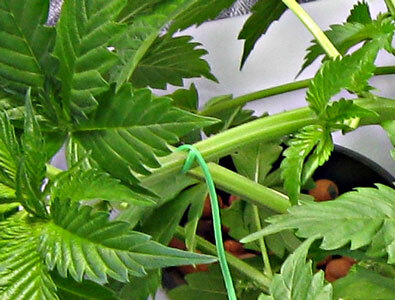 If you're going to LST your plants, you'll get the best results by starting early since it's easy to bend stems when they're young and flexible. As stems get older, they become hard and woody, making them difficult to bend without breaking! How exactly do you bend your plants? Only bend soft growth – Newer growth is soft and pliable, so it is easily bend to your will. It's important to focus on bending the newer, most flexible parts of the plant to avoid breakage. If a stem feels stiff, it will likely break if you try to bend it. Start Training Early – Start low stress training early in the plant life so you can avoid every having to try to bend thick stems. If you keep on top of plant training from the beginning, you will only even need to bend new growth and it will go much more easily. Make Sure Ties Are Securely Attached to Plant – Don't let wires or ties "scrape" or slip across the surface of a stem because it can cause abrasion (imagine something rubbing all over your skin until it gets raw). If you're having difficulty getting a specific stem to stay down without slipping, try to secure that stem in more places so all the stress isn't being placed on just one part of the stem. Quick Summary: Do this at least once a week! Basically, you're training the plant to grow into the shape you desire, further creating your own cannabis bonsai tree. 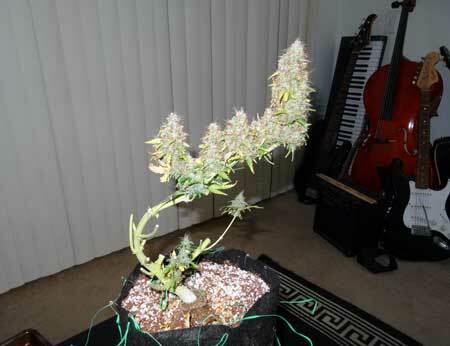 Always bend stems slowly and take care not to hurt you plant. You don't want to snap off any of the branches, so never try to bend stiff branches; they'll just break off. Many growers stick something in the soil and use that as an anchor to attach ties to, for example bamboo stakes or a tomato cage. You can really get creative about this! Don't tie down your plants in such a way that you won't be able to tend them or move them! You'll regret it later! For example, don't secure ties to something on the ground, or something else in the grow space. Try to make a self-contained container that you can pick up and move without disturbing any of the ties. This is why so many growers attach ties to the sides of their containers. You will not be able to train your plant just once and that's it. The plant training process needs you to watch over your cannabis plants so you can slowly create the shape you're looking for. It also helps you quickly spot any unruly branches so you can bend them over before they get too stiff. One thing to remember, bent stems immediately "realize" they're sideways, and any part that is not tied down will immediately start growing upwards again. The unbound parts of a healthy plant will point up again in just a few hours. If you check your plants a few hours after bending, you'll be able to see exactly what I mean. Because of the quick recovery time experienced by cannabis plants in the vegetative stage, LST can be used to create short, bushy plants in a very short amount of time. 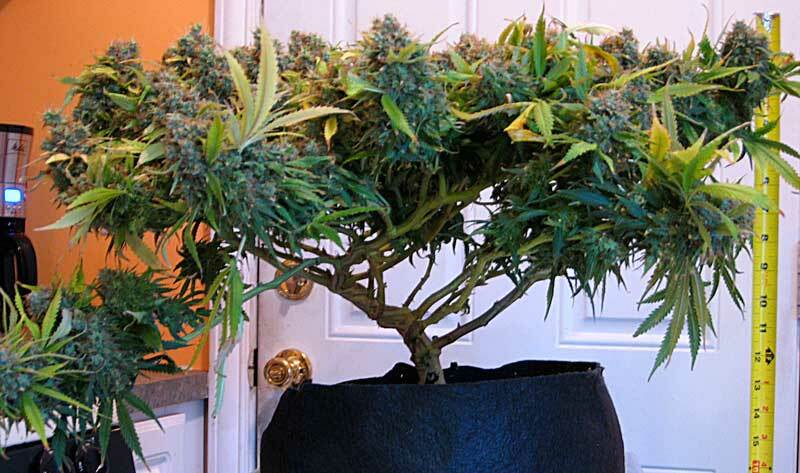 No matter how you secure your plant, the main idea is for it to hold down the branches in the shape that you want, while still allowing you to easily tend to your plants as they get bigger. That's worth repeating, don't tie down your plants in such a way that you won't be able to tend them or move them! You'll regret it later! 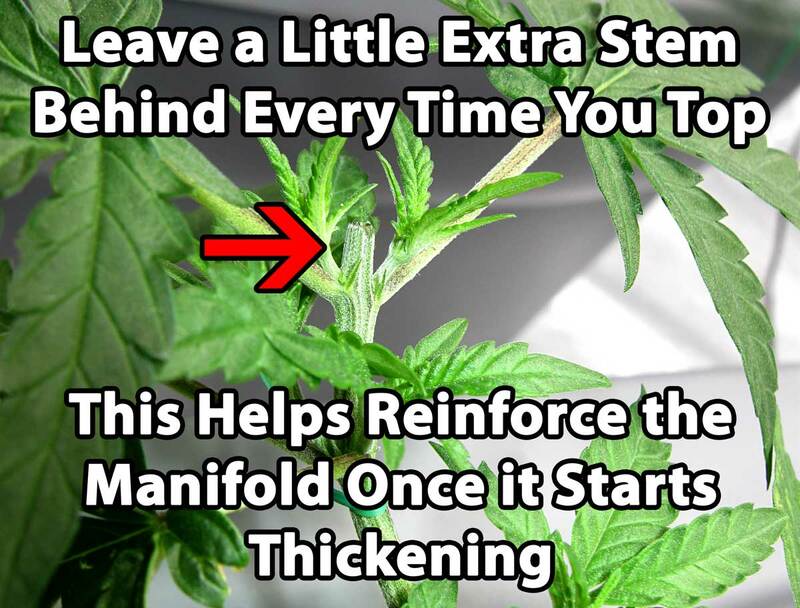 With LST, you'll get the best results if you check on your plant at least every few days to see if any stems are out of place, so you can quickly bend them over where you want. 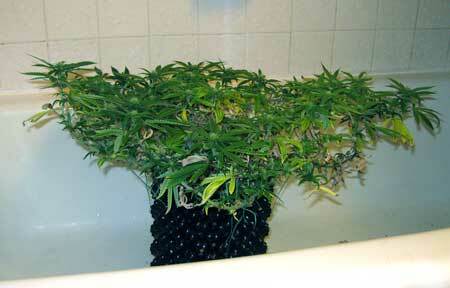 Continue to LST your plant throughout the vegetative stage until you get the height, width and shape you want. 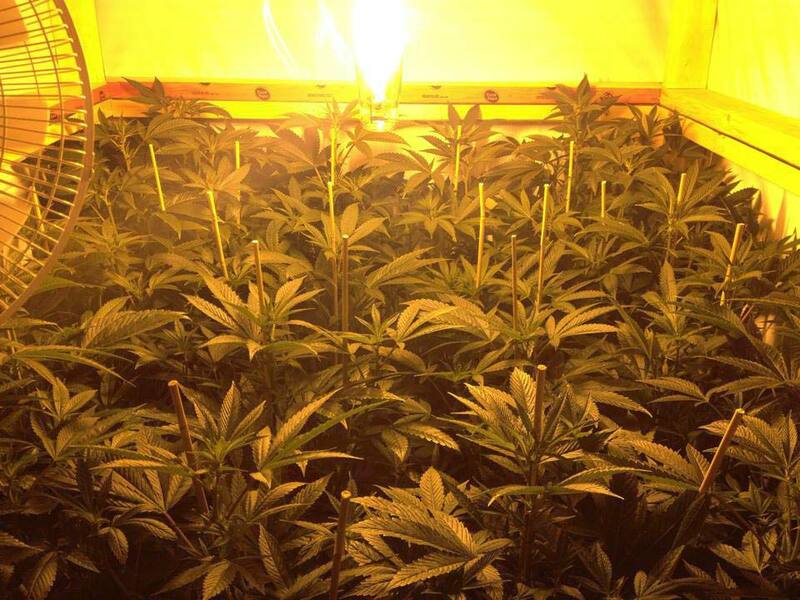 When a cannabis plant is switched to the flowering stage, it can double in height within just the first few weeks. This is known as the flowering stretch. But all that new growth needs to be controlled so you can maintain the amazing canopy you've been working on throughout the plant's life! After the first month of flowering, your work is pretty much done as far as LST. Phew! 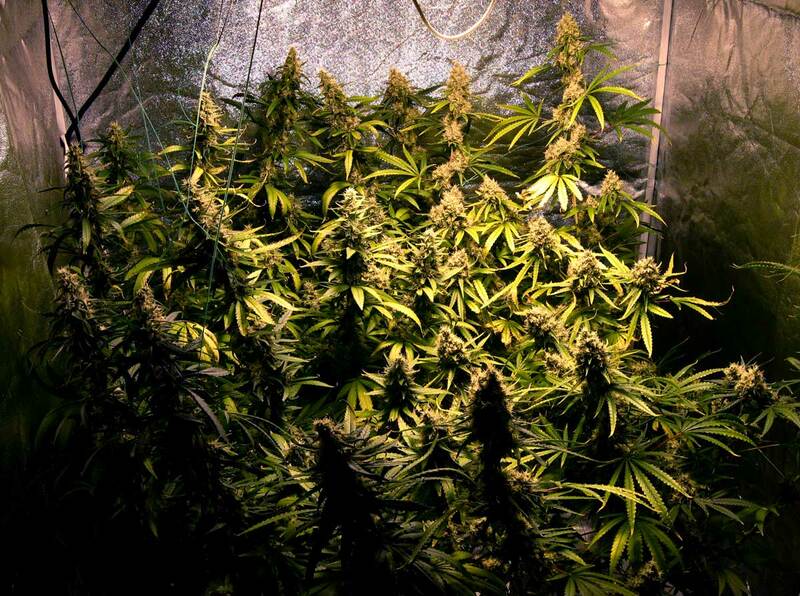 Now you get to sit back and just wait for your buds to fatten up. At this point, your plant is putting all its energy into making flowers/buds, and your plant structure will not change during the last several weeks of flowering. After the first month of flowering, it’s best to use LST only sparingly as needed, like when you have a troublesome stem that is cutting off light to other parts of the plant, or if a cola has grown too close to the grow lights. It is NOT recommended that you start LST while your marijuana plants are flowering. 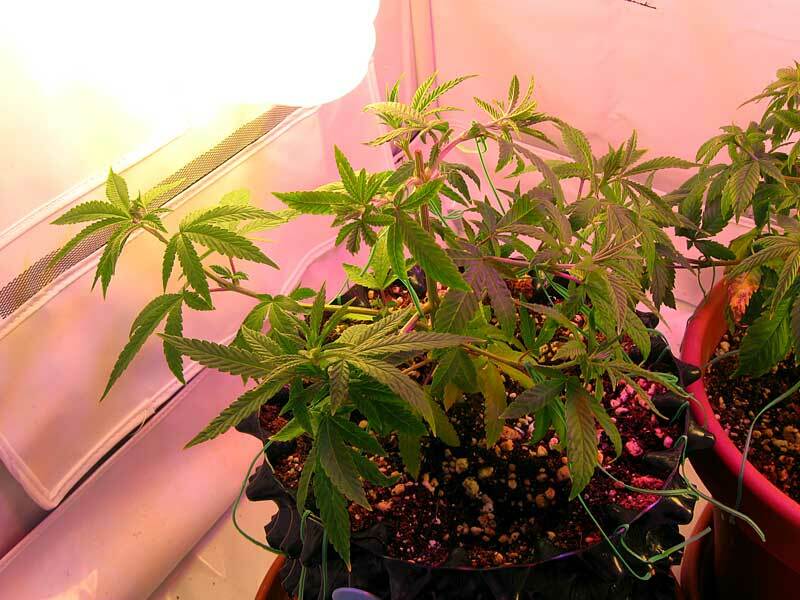 Proper LST must begin when the plant is in the vegetative stage, because by the time you get fully into the flowering stage, the majority of the plant structure has already been formed. If you’ve LST’ed properly in the vegetative stage, your plant should naturally start growing rows of colas along the flat table you produced, and you’ll get plants that produce bigger yields from your same grow lights. As you spend time training and observing your plants, you’ll begin to get a much better understanding of exactly what you're working with. I highly recommend viewing some cannabis time-lapse videos to get a better idea of how the cannabis plant grows. That's it! You now have all the tools you need to become an LST master and produce huge harvests of your own!